Dragon inflatable light towers are designed for maximum portability, brilliant illumination, and superior convenience. Portable light tower. Dragon light tower. Emergency management. Construction. Contractor. unique light tower. outdoor event lighting. inflatable light beacon. Dragon inflatable light towers are designed for maximum portability, brilliant illumination, and superior convenience. Case size 26" x 26" x 23" 23" x 24" x 18" 26" x 26" x 23"
The entire tower packs down into the built-in case. With the optional hitch mount, the Dragon can be rolled on any terrain or mounted to a receiver hitch on any vehicle. With the hitch mount, the tower can be transported and deployed from the back of a vehicle. 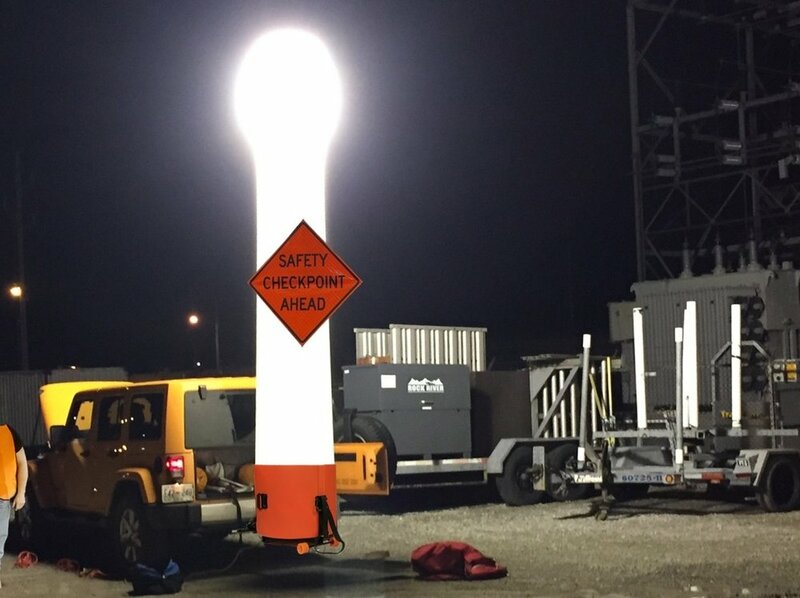 With rollup attachable signage, your light tower can become an incredibly effective method of communicating your message.